2.Size Option: Fitbit Blaze Replacement Bands fit for 5.1 inch-7.5 inch,please measure before purchase. Our Fitbit blaze wristband is made of flexible and durable soft silicone material,no worry the color will rub off in few days. With stainless steel buckle design,you no need to worry the bands will pop off easily. 1.Please DO NOT wear this band for long time in high temperature places. It is recommended to put it in the ventilated place after you exercise sweat. FIT FOR FITBIT BLAZE ONLY: ESEEKGO Replacment Bands fit well for your fitbit blaze tracker,durable and lightweight,very comfortable to wear it, and perfect to replace your original fitbit fitness wristband. 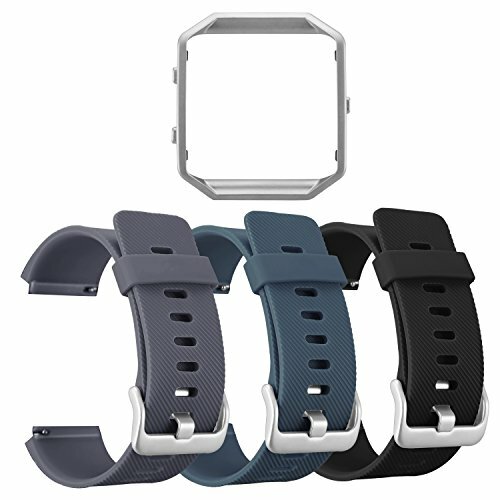 HIGH QUALITY SILICONE FITNESS WRISTBAND: Our Fitbit Blaze Band is made of flexible and durable soft silicone material , you can easy to install and remove the bands, no worry the color will rub off in few days.With stainless steel buckle design,you no need to worry the bands will pop off. ADJUSTABLE REPLACEMENT STRAP:This amazing Fitbit Blaze watch band can be adjusted to the wrist size (5.1"-7.5").Please measure before purchase. MULTIPLE CHOICE: Our fitbit blaze bands have 7 popular colors.Buy multiple and change daily to compliment your entire wardrobe. Dress up Blaze and highlight your unique taste. PACKAGE INCLUDE: 3 Pcs Fitbit Blaze Replacement band + 1 Pcs Metal Frame ( no tracker ).ESEEKGO provide 30-day money back and one-year warranty and friendly easy-to-reach customer service for you.Please feel free to contact us if you have any question BEFORE you review it. We will try our best to solve your problem.